(AP) OMAHA, Neb. - There won't be a Beijing repeat in London. Michael Phelps has dropped one of his eight Olympic races. Phelps' coach, Bob Bowman, announced Monday on the final day of the U.S. swimming trials that Phelps was scratching the 200-meter freestyle, leaving him with seven events at the London Games. The decision removes the chance of Phelps matching the record eight gold medals he won in Beijing. "It's so much smarter for me to do that," Phelps told The Associated Press. "We're not trying to recreate what happened in Beijing. It just makes sense." Phelps qualified in five individual events for London and is expected to swim all three relays. But, on Bowman's recommendation, he decided to focus on the 200 and 400 individual medley and the 100 and 200 butterfly. "No one should be expected to do that twice," Bowman said of the program Phelps swam in Beijing. "Once was more than enough." Bowman said his main concern was Phelps being fresh for the 400 freestyle relay. While the U.S. has traditionally dominated that event, the Australians are favored for London. 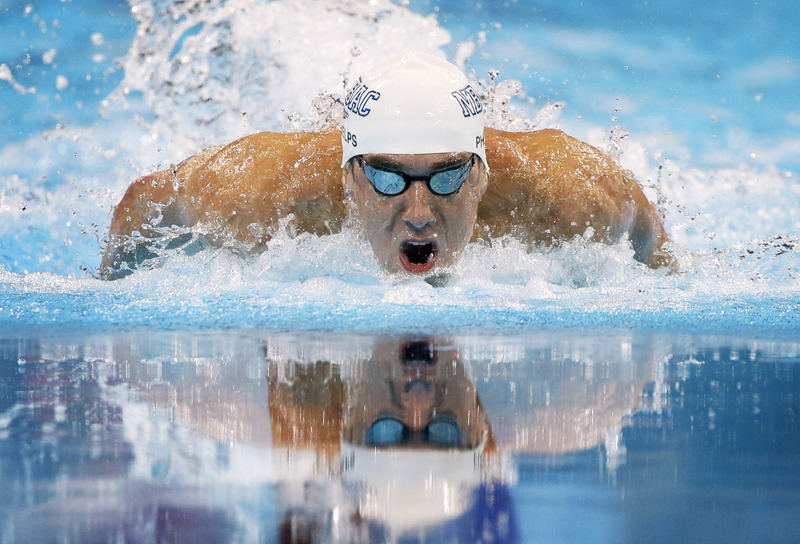 The relay was one of Phelps' closest calls in Beijing, with teammate Jason Lezak coming from behind on the anchor leg to beat a strong French squad. The relay final is on the same day as the preliminaries and semifinals of the 200 freestyle. "We respect the challenge we're up against," Bowman said with a smile, "and perhaps we'll be more ready than people think." Bowman said he raised the possibility of dropping an event early in the week, and Phelps was fine with it when they discussed it again after his final race of the trials Sunday night. "When we talk about technical things, he sees the logic of it quite easily," Bowman said. With Phelps dropping the 200 free, Ricky Berens moved up to claim an individual spot on the Olympic team for the first time. He was already scheduled to swim the 400 and 800 free relays. The 27-year-old Phelps had vowed to drop the grueling 400 IM after Beijing, but he put it back on his program earlier this year. Bowman wanted him to swim that event because it's on the first day of the Olympic program, which made it more appealing than the 200 free even though Phelps won that event at the trials and finished second behind Lochte in the 400 IM. "We like to get going," Bowman said. "No matter how it goes, we want to be in the mix. We don't want to wait until the second day." Phelps is giving up the chance to defend his 200 free title from Beijing and regain the world record that Germany's Paul Biedermann set at the 2009 world championships wearing one of the high-tech bodysuits that are now banned. Phelps will still have a chance to three-peat in his other four individual races. No swimmer has ever won the same event in three straight Olympics. Dropping the 200 free also removes one of Phelps' showdowns with American rival Ryan Lochte, the defending world champion. They will now face each other in just the two individual medleys. "It gives me a day off for recovery after the (400) IM," Phelps said. 'It's something that's needed. Swimming that many times is brutal and there's no need to put myself through that." There's another benefit as well, according to Bowman. No more comparisons to 2008, when Phelps broke Mark Spitz's iconic Olympic record. "We won't hear the number eight again," Bowman said.